Definition at line 31 of file HttpHdrSc.h. Definition at line 209 of file HttpHdrSc.cc. References addTargetAtTail(), dlink_node::data, dlink_list::head, dlink_node::next, and targets. Definition at line 37 of file HttpHdrSc.h. References addTarget(), addTargetAtTail(), getMergedTarget(), p, packInto(), parse(), setMaxAge(), updateStats(), and ~HttpHdrSc(). Definition at line 195 of file HttpHdrSc.cc. References dlink_node::data, dlinkDelete(), dlink_list::head, dlink_node::next, HttpHdrScTarget::node, and targets. Definition at line 355 of file HttpHdrSc.cc. References dlinkAdd(), HttpHdrScTarget::node, and targets. Referenced by HttpHdrSc(), and parse(). Definition at line 360 of file HttpHdrSc.cc. References dlinkAddTail(), HttpHdrScTarget::node, and targets. Definition at line 314 of file HttpHdrSc.cc. References dlink_node::data, dlink_list::head, dlink_node::next, NULL, String::size(), HttpHdrScTarget::target, targets, and String::termedBuf(). 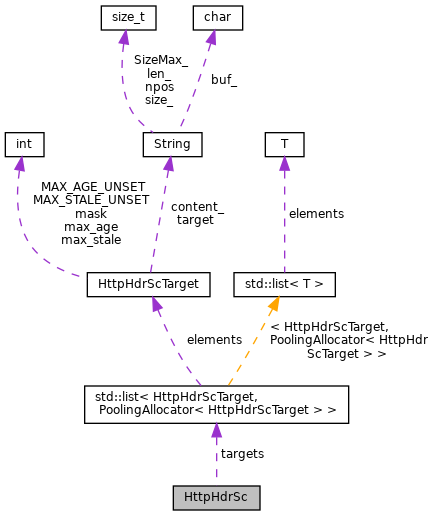 Referenced by getMergedTarget(), parse(), and setMaxAge(). Definition at line 334 of file HttpHdrSc.cc. References findTarget(), HttpHdrScTarget::mergeWith(), and NULL. Referenced by esiEnableProcessing(), HttpHdrSc(), and HttpStateData::processSurrogateControl(). Definition at line 33 of file HttpHdrSc.h. Definition at line 250 of file HttpHdrSc.cc. References assert, dlink_node::data, dlink_list::head, dlink_node::next, and targets. Referenced by HttpHdrSc(), and HttpHeader::putSc(). Definition at line 74 of file HttpHdrSc.cc. References addTarget(), assert, HttpHdrScTarget::clearContent(), HttpHdrScTarget::clearMaxAge(), HttpHdrScTarget::clearMaxStale(), HttpHdrScTarget::content_, debugs, findTarget(), dlink_list::head, httpHeaderParseInt(), httpHeaderParseQuotedString(), HttpHdrScTarget::isSet(), LookupTable< EnumType, RecordType, Hasher >::lookup(), HttpHdrScTarget::maxAge(), HttpHdrScTarget::maxStale(), HttpHdrScTarget::noStore(), HttpHdrScTarget::noStoreRemote(), NULL, p, safe_free, sc, SC_CONTENT, SC_ENUM_END, SC_MAX_AGE, SC_NO_STORE, SC_NO_STORE_REMOTE, SC_OTHER, HttpHdrScTarget::setMask(), strListGetItem(), targets, type, and xstrndup(). Referenced by HttpHdrSc(), and httpHdrScParseCreate(). Definition at line 264 of file HttpHdrSc.cc. References dlinkAddTail(), findTarget(), HttpHdrScTarget::maxAge(), HttpHdrScTarget::node, and targets. Definition at line 277 of file HttpHdrSc.cc. References dlink_node::data, dlink_list::head, dlink_node::next, and targets. Referenced by HttpHeader::getSc(), and HttpHdrSc(). Definition at line 48 of file HttpHdrSc.h. Referenced by addTarget(), addTargetAtTail(), findTarget(), HttpHdrSc(), packInto(), parse(), setMaxAge(), updateStats(), and ~HttpHdrSc().